Australia's Dollar has been overvalued by a foreign exchange market place far too eager to price in interest rate rises at the Reserve Bank of Australia we are told. 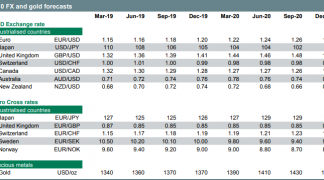 The overvaluation leaves the currency vulnerable argue HSBC Holdings who have accused currency traders of being fixated with the idea that G10 central banks are all rushing towards the exit from unconventional monetary policy. The presumption that the Reserve Bank of Australia wants to follow the lead of its peers and raise rates soon has ensured the Australian Dollar has been one of the better performing global currencies over the course of the past year with only the Euro, Swedish Krona and Norwegian Krone outperforming. The strength ensures the Pound to Australian Dollar is 2.47% down on where it was this time last year, and the Australian to US Dollar exchange rate is 3% higher. Currencies tend to rally in anticipation of an interest rate raising cycle at their central bank. For example, look how the USD rallied massively in 2014 as the Federal Reserve started tapering its quantitative easing programme and then moved towards rate hikes. More recently, the Euro has gained on similar expectations of reduced quantitative easing at the European Central Bank. The Canadian Dollar also appreciated sharply when in mid-June the Bank of Canada signalled a rate hike, which it subsequently delivered in mid-July. “With this strategy having worked so brilliantly with the USD, EUR and CAD, the FX market is now willing similar returns in the AUD and NZD. Both currencies have made strong gains in recent months. But this has been at odds with the rates markets moves,” say HSBC in a currency market briefing seen by Pound Sterling Live. “The FX market appears to be pricing in a repeat of the BoC but the rates market is not. The hunger for returns in the FX market is creating a dissonance,” say HSBC. It is suggested the AUD and the NZD are priced in anticipation of more hawkish monetary policy that simply might never arrive. Although neither has kept pace with the CAD, both are up significantly this year. To HSBC it appears a seed may have been sown by the RBA, which has allowed this view to germinate. On 18 July, the RBA’s minutes included a reference to the neutral cash rate being 3.50%. This was deemed as hawkish, with room for 200bp of hikes from the current 1.50% policy rate. The AUD jumped nearly 2% after the publication of the transcript. “Currencies are trying to price in a more hawkish monetary policy. The market thought the AUD could do a EUR or CAD,” say HSBC. However, “to us the FX market is getting over-excited. Rate expectations have moved largely sideways this year in Australia and New Zealand,” say HSBC. The local rates market is still not even pricing in a 50% probability of hikes until Q2 2018 in Australia and Q1 2018 in New Zealand. 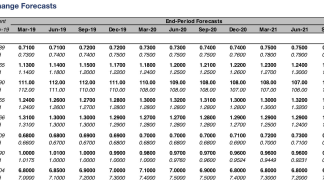 HSBC believe there is a discrepancy opening up between the rates and FX markets, which suggests to us that the AUD and NZD have rallied too far and too fast. HSBC research suggests that it is in fact the foreign exchange markets that are wrong - the interest rates market have it spot-on. Therefore, the correction to sanity will be made by the currency which will have to move lower. 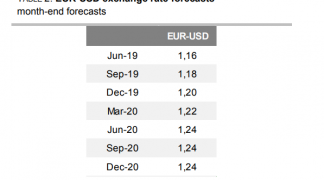 “With little impetus for rate hikes locally, and a risk that both central banks become more vocal in their aversion to currency strength, we see both AUD and NZD falling this year,” say HSBC. Analysts forecast AUD-USD at 0.75 and NZD-USD at 0.70 by year-end. But amid the current weak-USD backdrop, AUD and NZD downside could be even more pronounced against the likes of the EUR and CAD. 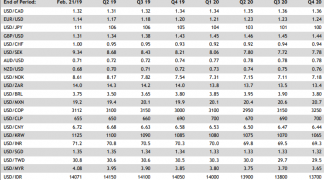 HSBC see the Euro as offering substantially more upside. However, Aussie Dollar weakness won’t necessarily feed into GBP/AUD strength. The Pound to Australian Dollar exchange rate is forecast to end the year at 1.60, at present it is at 1.65. It should hover around 1.60 for the duration of 2018 argue HSBC. The Pound to New Zealand Dollar is forecast to end the year at 1.71, down from 1.77 currently. GBP/NZD should hover around 1.71 for the duration of 2018. HSBC's assumptions on the RBA could however be undermined by increasing debt levels amongst Australians and a hot housing market. The release of the RBA's August board meeting minutes show the Bank to be nervous about increases in household debt while appearing less-confident that house price growth is moderating to a satisfactory degree. The RBA is clearly not in the mood to change interest rates in either direction at present as the Australian economy is not running in top gear with the Bank noting "ongoing low wage growth and the high level of debt…..raising the possibility that consumption growth could be lower than forecast". But this might soon change as the Bank's hand is forced by developments elsewhere in the economy. "We think the changes to the Minutes do elevate the focus on financial stability in a way that raises the risk of policy action at some point," says David Plank, an economist with ANZ Bank. The RBA explicitly cites “the need to balance the risks associated with high household debt in a low-inflation environment”. Plank says this is an interesting change from the last couple of Minutes which had references along the lines that “developments in the labour and housing markets continued to warrant careful monitoring." ANZ don’t think this evolution has reached the point where the RBA would move interest rates to better manage the financial stability objective at the expense of the other two. "We do think, however, that we are closer to the point where the RBA might move interest rates for financial stability reasons if it had a high degree of confidence that the first two objectives were being achieved," says Plank. So it could be that an interest rate rise is in fact possible sooner than later - but the impact of a rate rise on the Australian Dollar of a rate rise targeting financial stability as opposed to one being a reaction to a strengthening economy is not necessarily bullish. While the rate rise might achieve financial stability by cooling debt growth and house price inflation, it might also spark a retreat by consumers and slow the economy further. This is an example of where a rate rise turns out to be a negative for a currency.